West Virginia Wesleyan College, in conjunction with MetroNews, announces the beginning of the 11th annual West Virginia Scholar Program for high school juniors in West Virginia. The top student will win a four-year scholarship to Wesleyan, valued at more than $160,000. A second place prize of $5,000 and third place prize of $2,500 will also be awarded. All awards begin with the 2019 fall semester. “We are thrilled to enter our eleventh year of partnership on the West Virginia Scholar program,” said John Waltz ’01, vice president for enrollment management. “Every year we are privileged to read each application and meet the absolute best and brightest students in West Virginia. These scholars not only excel in the classroom but also in athletics, creative arts, and service and leadership. Students can apply at wvmetronews.com. An essay detailing how the applicant plans, through their studies and continuing education, to make West Virginia a better place to live. The application deadline is April 15. 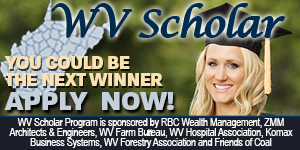 Online voting at wvmetronews.com will be held directly after, and the winner will be announced at the 2018 WV Scholar Award Luncheon at Wesleyan in June. In addition to MetroNews and Wesleyan, sponsors include the West Virginia Hospital Association, ZMM Architects and Engineers, the West Virginia Forestry Association, the West Virginia Farm Bureau, RBC Wealth Management, Komax Business Systems, and Friends of Coal. Please contact the Office of Admissions at (800) 722-9933 for more information.